NEW YORK (CNNfn) - There are those among us for whom math just makes sense. They are the followers of Pythagoras. The ones who breezed through calculus. And more likely than not, the ones who can tell you how long it takes train A to catch train B � factoring in wind velocity, speed and freight loads. They are the math majors of the world. "There are options out there," said Tom Rishel, associate director of programs and services at the Mathematical Association of America in Washington. "It's not just a question of being a teacher or actuary. There are all these other possibilities." They fall into one of two categories. The first, the BLS notes in its latest Occupational Outlook survey, is the theoretical mathematician, who develops new principles and recognizes previously unknown relationships between existing principles of math. The second group is referred to as applied mathematicians, who use techniques such as mathematical modeling to solve practical problems in business, government and life. That can include helping companies streamline their manufacturing process or analyzing the efficacy of a new pharmaceutical product, the BLS notes. For example, airlines frequently hire math majors, particularly those with a background in economics, to determine the amount of fuel required to fly their routes and project passenger demand and maintenance costs to produce flight schedules, The College Majors Handbook, published by JIST Works Inc., reports. The number of students who major in general math is shrinking. Those who do often go on for a higher degree and eventually teach. Where such a program is offered, however, applied math is becoming the degree of choice for students looking to enter the corporate workforce. "I would recommend an applied degree," said Carla Martin, a 1995 graduate of Virginia Polytechnic Institute and State University. "But either way I would recommend taking a few courses in computer science. When I was interviewing for jobs, the most common question I heard was, 'Do you know how to program?'" She said companies aren't necessarily looking for a second major in compsi, or even a minor in it; they are looking for students who know the basics of programming. Martin, who is back in school at Cornell University pursuing her Ph.D. to become a professor, had been working as a consultant for four years with PricewaterhouseCoopers, helping clients crunch their marketing numbers. Few who major in math emerge from college to actually become mathematicians. Job market data reveal most these days specialize in computer science, engineering and economics, finding work in brokerage firms, investment banks, and software or consulting firms. Many ultimately, in fact, receive a double major in such concentrations, helping to enhance their marketability and earnings potential. "Many of our students double major in economics or computer information systems, and if you talk to students across the country I think you'll find more and more the phenomenon of double majors," said Joseph Jerome,� a math professor at Northwestern University. "With just an undergraduate degree in math, I'm afraid, the pickings are slim unless you get an advanced degree." Just one-third of graduates from an applied mathematics, operations research or statistics program consider their job to be closely related to their major, the Handbook reveals.� The majority work as top- and mid-level managers, actuaries, computer systems analysts, computer programmers, computer engineers, and in insurance, securities, real estate and business services. About 8 percent of applied math majors end up in education, while 19 percent of general math majors teach. "Many of our students double major in economics or computer information systems and if you talk to students across the country, I think you'll find more and more the phenomenon of double majors." - Statisticians, who analyze and interpret numerical data, including "sampling," where they obtain information about a population or group of people by surveying a small cross-section of them. - Actuaries, who are used by insurance companies, pension funds and other organizations to determine risk levels in a transaction, make price decisions and formulate investment strategies, the BLS writes. Mathematicians held about 14,000 jobs in 1998; another 20,000 held mathematical faculty positions at colleges and universities, the American Mathematical Society reports. According to Rishel of the MAA, consulting work for companies like PricewaterhouseCoopers and William M. Mercer also has become an increasingly popular career path for math majors with a bachelor's degree. Such firms seek out math-minded recruits, he said, to gather and analyze statistical data that help clients decide where to market their products, and how to do it cost effectively. He also notes the federal government, specifically the National Security Agency, hires large numbers of math grads for cryptography work, which involves encoding and decoding data. Telemetry work also is in demand, which essentially just means you pick signals out of the airwaves and translate them to determine who is using which part of the airwaves and for what. The job market for all three leading occupations for math majors --� actuaries, statisticians and operations research analysts � is expected to grow less than 10 percent through 2008, the BLS reports. But jobs that involve computer programming are projected to grow 21 to 35 percent over the next eight years. Salaries in the field can be quite high. 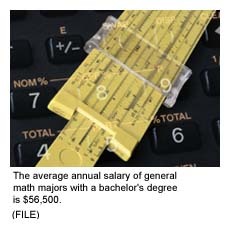 The Handbook reports that annual average salaries of general math majors with a bachelor's degree is $56,500, 17 percent higher than the average for all college grads. 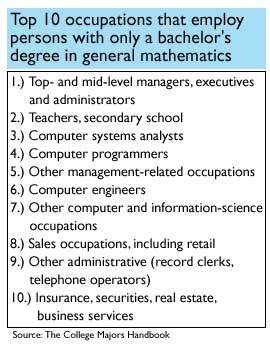 The average for applied mathematics graduates is closer to $53,900, which is 12 percent higher than the overall average. More specifically, the BLS reports that operational research analysts earned roughly $49,000 in 1998, the most recent year for which data are available. The top 10 percent earned roughly $88,000 and the lowest 10 percent earned just under $30,000. Median annual earnings of actuaries that same year were $66,000, with the top 10 percent earning $124,000 and the bottom 10 percent earning $36,000. Lastly, the BLS reports statisticians brought in roughly $49,000, with the top 10 percent earning $87,000 and the lower 10 percent earning $28,000. But it's not just about the money. "Math majors do fairly well [on income], but it's a lot of hard work and you have to be willing to work hard," said Stephen Chase, associate chairman and director of undergraduate studies at Cornell University. "They should be able to handle abstractions and substantial doses of theory." He notes, too, that there's no single personality type best suited for such a degree. "The standard assumption is that math majors have a shy, retiring personality, and there are certainly a share of those, but we have many types of personalities and many people with a wide variety of interests outside of math."